On this 19 day luxury cruise & tour, transit the Panama Canal and travel through Colombia before exploring the ancient ruins of Machu Picchu in Peru. Discover countries that abound in natural beauty and will fascinate you with their rich history, World Heritage-listed natural and man made treasures, pristine jungles, epic mountains, sacred valleys, ancient ruins and iconic cultures. 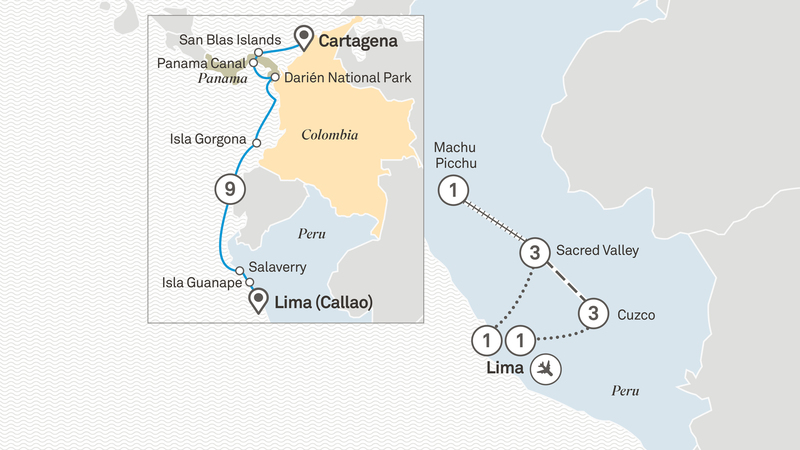 Cruise in all-inclusive luxury on board Scenic Eclipse from Cartagena, through the Panama Canal and along the coastline to Peru, a country that will fascinate with its rich history and ancient cultures. From the friendly hospitality of the Sacred Valley to the ruins of Machu Picchu, this journey of Peru will delight. Explore markets, meet local communities, uncover majestic ruins and colonial cities against the stunning backdrop of the Andes. Welcome to lively and colourful Cartagena where your journey into wonder begins with a warm greeting by the crew as you step on board Scenic Eclipse. Raise your glass this evening and toast the start of your cruise. Please book your flight to arrive prior to 1pm. Spend the day relaxing in this beautiful archipelago surrounded by clear water and coral reefs swarming with marine life, pristine sandy beaches and coconut palms. Scenic Discovery excursions are available from snorkelling, paddling by kayak, to relaxing on a pristine beach with a chef-prepared picnic. One of life’s great experiences is to transit the Panama Canal, one of the world’s key strategic artificial waterways. From Gatun Lake to the Pacific Ocean, the full day journey through the Isthmus of Panama is 77 kilometres long and will take you through three locks where Scenic Eclipse will descend 27 metres. Enjoy this experience from any vantage point on board Scenic Eclipse; from one of the viewing decks to the privacy of your suite’s verandah, it is sure to be a memorable experience. World Heritage-listed Darién National Park is only accessible by water on a small ship. A natural bridge spanning the two Americas, it houses a myriad of habitats, ranging from rocky coastlines to sandy beaches and mangroves, and is one of the few remaining examples in the world of a protected area inhabited by humans. On your Scenic Discovery excursion venture up the Mogue River to find the Embera Indians who will take you into the heart of the jungle on their traditional boats. Spot some of the rare, endangered species endemic to the park including the Black-headed Spider Monkey, the Capybara and American Crocodile. Located off the coast of Colombia, this tiny World Heritage-listed atoll has been transformed from a former island prison to a wildlife sanctuary. Onshore you will discover monkeys, caimans, a myriad of bird species including the blue-footed booby, the magnificent frigate birds and the endemic anole, the world’s only pure blue lizard. The deep blue waters and coral reefs around the island host an abundance of marine life, from inquisitive dolphins and porpoises to a possible glimpse of the majestic sperm whales. Take a walk across the island with your local guide discovering the fauna and flora of the rainforest or walk to Yundigua beach and snorkel the pristine reefs and waters with your guide in search of marine life. Choose a Scenic Discovery excursion from a snorkelling adventure in the deeper water offshore, or kayak the coastline and bays of this small atoll. Relaxation and rediscovery are yours to enjoy. Take a cooking or tasting class in Scenic Epicure or a yoga or pilates class in the studio. Allow your palate to be delighted by the extensive range of dining venues or allow your butler to serve you in-suite. Daily entertainment or some quiet time in The Observatory, all this and more is at your fingertips. Salaverry is the gateway to the cultural capital of Peru, picturesque Trujillo and the amazing ruins of Chan Chan the largest earthen city of pre-Columbian America. Discover the sacred adobe temples, the Pyramid of the Sun and Moon or explore the amazing World Heritage-listed site of Chan Chan. Or you may choose to tour the charming colonial city of Trujillo. Witness a Peruvian music and dance performance. This evening there is time to discover the ambience of Trujillo at your leisure. Lying off the Pacific Ocean coast of Peru this small island chain is a wildlife refuge and home to large colonies of inquisitive Southern sea lions and hundreds of seabirds including Humboldt penguins, pelicans and boobies. Take a Scenic Discovery excursion by kayak to a nature walk to explore these wildlife rich islands. Lima signals the end of your cruise as you disembark for an overnight stay and meet your Tour Director. Founded by the Spaniard Francisco Pizarro in 1535, follow in his footsteps to uncover Lima’s colonial history this afternoon then join your Tour Director for a ‘Welcome to Peru’ dinner. Fly to Cuzco then travel through the picturesque Sacred Valley for your three night stay. Your relaxing stay in the Sacred Valley allows you to experience the history, unique lifestyle, culture and majestic scenery of this heartland of the former Inca Empire. This evening delight in a Farm to Table dining experience. Harvest, prepare and cook with the close guidance of your chef, then sample your gourmet delights in the grounds of the hotel with the backdrop of the surrounding peaks. Join your expert local guide for a walking tour of the town of Ollantaytambo, the site where Manco Inca defeated the Spanish conquistadors. At Hacienda Huayoccari sample a delicious lunch of Andean specialities and see the Chinchero village weavers demonstrate their centuries old hand-woven techniques. The afternoon is at your leisure to relax and enjoy the facilities of your hotel. Enjoy an unforgettable culinary experience of five different meats cooked five different ways over an open flame, with ingredients grown in the hotel’s organic garden. Tour the impressive ruins of Pisac and its colourful markets, or see the ruins of Moray and the Incan salt pans. Alternatively, at Chinchero meet a local family, learn about their lifestyle and explore this picturesque village. Tonight share stories of your excursion with your fellow travellers as you enjoy a private performance by local musicians complemented with a tapas style dinner. Walk to the train station for your rail journey to Machu Picchu. The mighty Incan Empire built this astonishing World Heritage-listed Site in the 15th century. Standing 2,430 metres above sea level, in the middle of a tropical mountain forest, its giant walls, terraces and ramps seem as if they have been cut naturally in the mighty rock escarpments. Abandoned when the Spanish conquistadors arrived and only rediscovered in 1911, you’ll be amazed as your expert local guide shares the mysteries of these majestic ruins. Tonight relax in your charming hotel. Explore the village of Machu Picchu at your leisure this morning. Marvel at the spectacular views from the glass dome carriages on your rail journey through the incredible Andes. Continue to the charming city of Cuzco for your three night Special Stay, set in the heart of the historic centre. The former capital of the Incan Empire, Cuzco is a city with incredible architecture. On your walking tour you will uncover the history of this World Heritage-listed Site. Your final stop will be the imposing ruins of Sacsayhuamán fortress. Visit a community school supported by Scenic and meet the teachers and pupils. Uncover the secrets of the iconic Peruvian coffee and Pisco on a tasting tour, or choose to explore the fascinating San Pedro food markets with a local guide followed by a cooking class. Alternatively, discover the picturesque San Blas artisan quarter on a walking tour. Dine at the MAP Café restaurant or try the intimate Cicciolina restaurant. Fly to Lima and visit Museo Larco. Continue to your hotel for an overnight stay. Join your Tour Director for a Farewell dinner this evening. There isn’t a country in South America more complex and fascinating than Peru. Discover Machu Picchu, Cuzco & Sacred Valley on this 10-day luxury tour.